When Social Media Fails, Where Will You Turn? 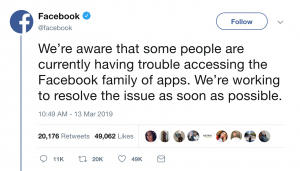 Recently, two of the world’s largest social media networks, Facebook and Instagram, temporarily went down for most of the day, causing complete pandemonium online. Influencers, advertisers, CMOs and consumers alike were losing their minds as two major platforms were out of use. Social campaigns lost money and many were unsure of what to do, or how to communicate. 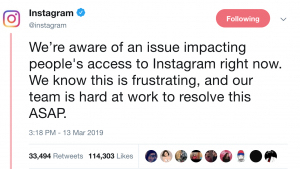 To calm the stir, both Facebook and Instagram ended up releasing statements via competitor site Twitter. This chain of events provokes a question I hear frequently from those who ask me for PR advice: “should I rely solely on social media?” If the recent outage serves as any indication of what could happen to your list of clients and customers, I have two words for you: absolutely not! While social media is a prime and convenient way to reach your audience, it shouldn’t be the only channel you use to stay in contact with them. Approaching marketing from an integrated approach should always be top of mind. When building a social media community or following, it’s important to understand that the customers who click “follow” or “like” aren’t yours. They’re the property of Facebook, Instagram, Twitter, YouTube, etc. While they may be “following you,” the social media platform has complete control of what your audience sees and ultimately, what they do. This very reason is why having a solid email list and email marketing strategy is so important. It’s vital to understand that social should help your brand or organization generate leads that bring potential customers to your website to sign up for, yes, you guessed it, your email list. Don’t let social media vanity metrics fool you, research shows that email marketing is still the most effective way to close the sale and bring in better ROI. In fact, customers gained through email have a higher lifetime value than those acquired through social media. This isn’t to say that social media holds no value. Social media is no longer a fad but an important tool that helps brands and businesses share information. In short, it’s worth incorporating into your marketing strategy. They key isn’t to avoid social media but to ensure that it’s integrated soundly into your strategy alongside an email marketing plan. Remember, the next time social media “goes rogue,” your email list will be there to make sure you don’t miss a beat. 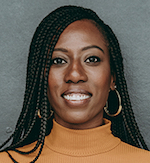 Tawanda Carlton is an account executive at Media Frenzy Global in Atlanta.